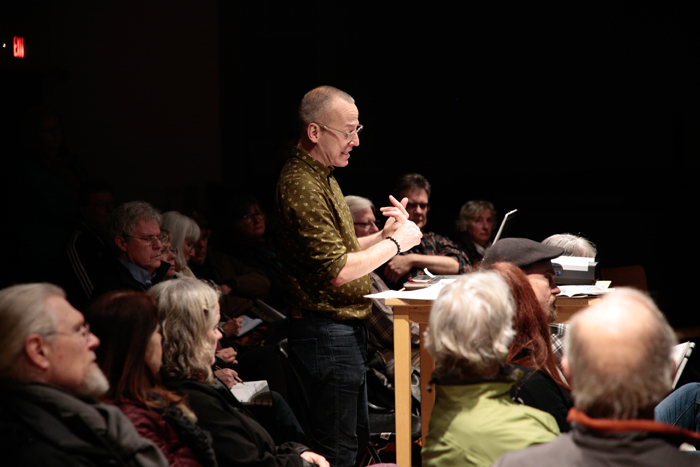 Claude Tremblay of Living Oceans discusses Sea Level Rise during a community talk at Mahon Hall on Jan. 28. Over the next three decades, ocean levels are expected to rise by at least 0.5 metres and islanders need to be ready, according to a community presentation put on by Living Oceans Society through the Islands Trust on Jan. 28. According to Living Oceans, global sea levels have been increasing gradually over the last century, and that rate has increased over the last 20 years. The rise in water levels is expected to reach at least one metre by 2100, and could be more depending on future events. The increased water level will bring an increase in salt water intrusion, higher shoreline erosion, flooding and increased damage from storm surges and high tides. In B.C., 80 per cent of the population lives within five kilometres of the coast. That adds up to around 3.5 million people in the province who will likely be affected by rising ocean levels. Though the effects of sea level rise will be gradually increasing over the years, Living Oceans recommends beginning to plan for higher water levels now. Living Oceans has identified four ways to deal with rising waters. These include protecting against it using natural barriers, accommodating it in the design of new buildings, avoiding it by building new projects further away from the flood plain or retreating from the coast all together. One difficulty for planning for sea level rise is knowing exactly where the new coastline will be. Predicting new waterlines necessitates a precise knowledge of the topography of a given area. Using tsunami flood plain calculations as a baseline, Living Oceans recommends building at a 1.5 metre vertical setback, combined with a 15-metre setback for buildings within the Georgia Strait area. The Department of Fisheries and Oceans originally funded Living Oceans to give four talks on the subject to coastal communities. They have already exceeded that amount, and are fielding requests for more discussions from other areas. Both the federal and provincial governments have contributed funds for the assessment of sea level rise planning. Funding also exists for the infrastructure phases. A list of funding sources and other information is available on the Living Oceans website. For more on this story, see the Feb. 14, 2019 issue of the Gulf Islands Driftwood newspaper, or subscribe online.